Djennyfer Joseph, who is from Haiti, filled an order at the Shake Shack on Newbury Street. 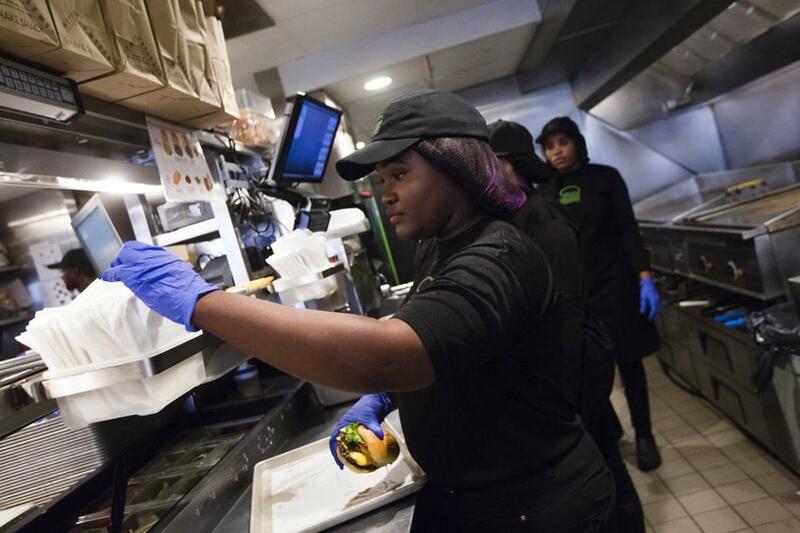 The lunch rush was just beginning at Shake Shack on Newbury Street and the all-American tasks of grilling burgers and making milkshakes were being handled by a crew made up almost entirely of immigrants — from Haiti, Senegal, Morocco, El Salvador, and Ethiopia. But these weren’t just people who happened to apply for a job: All of them were actively recruited by the restaurant chain, including those who spoke little English — a marked difference from years past, when only workers with strong English skills made the cut. Like other employers struggling to fill jobs in a tight labor market, Shake Shack has started seeking out candidates it might not have considered before. Spaulding Rehabilitation Network is opening the door to those with criminal backgrounds, in partnership with the Suffolk County Sheriff’s Department. CVS is bumping up its efforts to attract workers with disabilities, while other employers are lowering experience and education requirements. Many of these jobs are minimum-wage, entry-level positions, but they are bringing in people long relegated to the sidelines. And, as it turns out, some of these “hard-to-employ” people make excellent workers. Joseph, who studied English in Haiti and also speaks French and Haitian Creole, has been at the Newbury Street restaurant for less than a year and is working toward becoming a cross-trainer, a kind of jack-of-all-trades role that comes with a bump in pay from $12 to $14 an hour. Joseph also recently became a certified nursing assistant, a profession in high demand, but plans to keep working at Shake Shack even after she finds a job in health care. Shake Shack managers say they have had great success with the roughly two dozen immigrants — many of them refugees — that the restaurant has hired through Jewish Vocational Service over the past year. They are hard workers with a low turnover rate, and are more than making up for the decrease in the number and quality of college students and American-born adults applying for jobs there, managers say. The pool of available workers has been shrinking as the US unemployment rate has dropped to the lowest rate in 17 years and the labor force participation rate among 25-to-54-year-olds has declined. Stagnant wages that keep caregivers and others from reentering the workforce, retiring baby boomers, and more occupations requiring specialized skills have dragged down the number of people in the workforce, as has the growing number of Americans with criminal records, in part a result of increased enforcement of drug laws. This has left employers scrambling to fill jobs, and with the shortage not expected to let up anytime soon, many of them are looking in unexpected places. JVS runs a nursing assistant certification program, which trains between 12 and 15 people every three months, and for the past year and a half, Rubin said, employers have outnumbered graduates at the job fair that takes place at the end of each graduation ceremony. From 60-something pharmacy tech trainees to refugees learning English, “all of our graduates are being hired,” he said. The need is so great that the fast-growing fast-casual restaurant sector has started reaching out to JVS to find workers. Many of the immigrant trainees are Muslims who won’t handle pork products, Rubin noted, so when Sweetgreen took bacon off its menu in 2016 for health reasons, the chain inadvertently increased its pool of potential workers. Of the 100 or so workers JVS has placed at Sweetgreen, Rubin estimates, about 20 percent are Muslim. Triangle in Malden, which trains and supports people with disabilities, is also getting more requests for workers, largely from health care and retail companies, including CVS. A few years ago, 60 percent of people graduating from Triangle’s nursing assistant and culinary programs were getting jobs; currently, the placement rate is nearly 80 percent. Many workers with disabilities only want to work part time, which fits with what many employers are seeking, said Taciana Saab, director of workforce development at the nonprofit. And as companies struggle to keep people from leaving for better jobs, workers who are content to stock shelves and work in customer service are increasingly valuable. In addition to recruiting more low-income women and workers with disabilities for nursing assistant jobs, Spaulding Rehabilitation Network recently started working with the Suffolk County Sheriff’s Department to groom ex-offenders for jobs in food service, transport, and warehouse work. The position will depend on the nature of their offense, said Colleen Moran, director of workforce programs for Spaulding. Someone convicted of theft, for instance, would probably not be hired to run a cash register, she said. This component of the sheriff’s department reentry program is set to launch soon, with a growing list of employers willing to hire people with criminal backgrounds — hospitals, restaurants, printers, technology firms — and training developed around their needs. The sheriff’s department has long had a vocational program, but is working more with employers as the hiring crunch intensifies, said spokesman Peter Van Delft. While some businesses prefer to keep their interest in hiring ex-offenders under the radar, he said, employers are realizing there is a large pool of available workers they can tap into. Of course, hiring these nontraditional workers can present challenges for employers, who might have to make adjustments for someone who is blind or has a limited grasp of English.